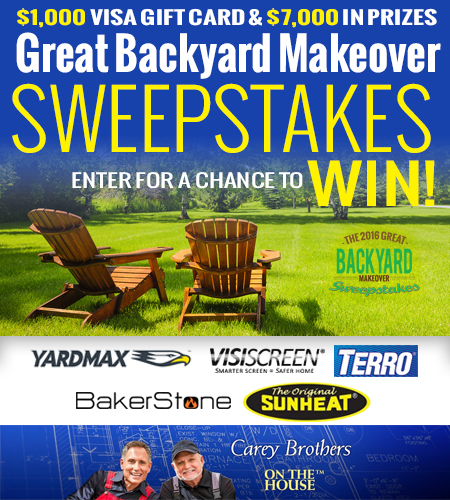 This Great Backyard Makeover Sweepstakes includes $1,000 VISA Gift Cards, with 7,000 in prizes from great brands including YARDMAX, Visiscreen, Terro, Sunheat and Bakerstone. TERRO indoor and outdoor bug control products. Includes a wide assortment of liquid ant baits, aerosol sprays, perimeter granules/dust and insect traps. The “The Carey Brother’s Great Backyard Makeover Sweepstakes” is open only to permanent legal U.S. residents of the 48 contiguous states and the District of Columbia; residents of Alaska and Hawaii are not eligible. Void in all other geographic locations. No purchase necessary. Void where prohibited. Contest Period runs from 12:00 a.m. (EST) Saturday, May 28th, 2016 and ends at 11:59 p.m. EST on Saturday, July 9, 2016 . One entry per household per day on. Odds of winning depend on the number of eligible entries received. See Official Rules and Prize List. My backyard needs all the help it can get! Could really use a backyard ,makeover.thnx for the chance. I really need a backyard makeover.thnx for the chance. This would be the ultimate house warming gift. The new back yard is a serious mess!! My daughter is moving and the backyard makeover would mean the world to her. Yard tools,this is a nice sweepstakes.